Witney News - The final act of Halloween - recycle your pumpkin! The final act of Halloween - recycle your pumpkin! That is the message from West Oxfordshire District Council which is keen to see as many pumpkins recycled as possible. Once Halloween is over, residents can cut them up and place them in their food waste bin to be picked up as part of their usual weekly collection. 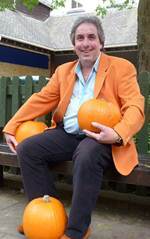 Cllr Richard Langridge, Cabinet Member for Environment at West Oxfordshire District Council, said: “Halloween grows more popular every year but one of the scariest parts for us is the thought of all those pumpkins going to waste. Last year, with the help of residents, the District Council collected almost 3,500 tonnes of food waste in West Oxfordshire which was taken to the processing plant near Cassington to be recycled into electricity and fertiliser. For more information about waste and recycling in West Oxfordshire, or to order a free food waste bin and kitchen caddy, see www.westoxon.gov.uk/bins or call 01993 861000.